No traditional Indian wedding is complete without the color red. The combination of red with mostly gold is what makes an essential part of any Indian wedding. Red outfit. Red roses. Red mandap. This bright color is the essence of any wedding. If you’re planning to go all traditional on your big day, here are some great ideas to utilize the red in a smart way, without making it look gaudy and outrageous. The main idea? It’s to add some touches of softer hues so the red works as the perfect pop of color. For the perfect traditional look, crimson or ruby red table colors can be a treat for the eyes. Balance of the bright red with white or gold tableware. Another great option is to use gold table covers with red tableware. The perfect balance of red and white will be enticing and not too much of an eyesore like in the case where everything is red. Red roses can be the perfect centerpiece attraction for the tables. With a gold tablecloth, use red rose petals in crystal vases or a crystal bowl filled with water and red floating candles. The idea of candles instead of roses is contemporary, stylish and romantic too. 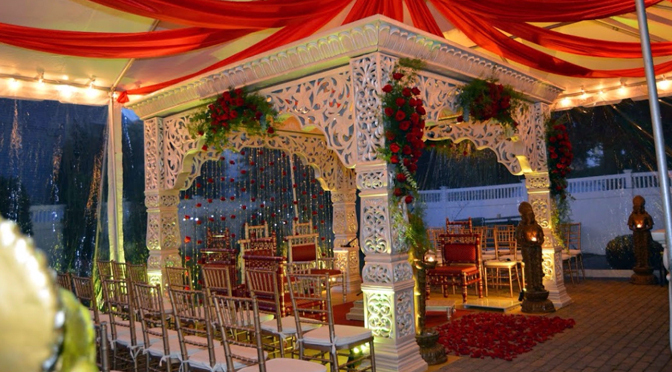 Go for a beautifully decorated mandap with roses, daisies and tulips. If you’re all up for the traditional mandap décor – then this is your choice. Else you can go the other way round – more tulips and daisies, with a pop of red here and there. Both ways, it looks beautiful – choose what suits you more. Give away mithai, candies, sweets, or other edibles in red favor boxes. Another great idea is to use mini glass jars with red ribbons around each. The latter gives a beautiful and stylish feel while keeping the traditional red standing out. Another great way to add red to the wedding is to give away red colored mithai to the guests. Many Indian sweets like barfi ¬can be colored in various hues using food coloring – so why not go for red barfi? If it’s an outdoor wedding, it’s a great idea to use foods that are red in color – e.g., watermelon, strawberries, curries in red sauces, beetroot, pastas and so much more. If not the food, then the food station can be decorated in red with roses or red cloth. The ideas for a red wedding are numerous. The same color can be used to give your event both a traditional and contemporary feel – it really depends on how you play with the color red and the choice of hues you use in combination with it. Wedding planning can be exciting yet strenuous. If you’re planning to celebrate your big day the Indian way, our wedding planners at Glamorous Event Planners can make it extraordinarily special for you.